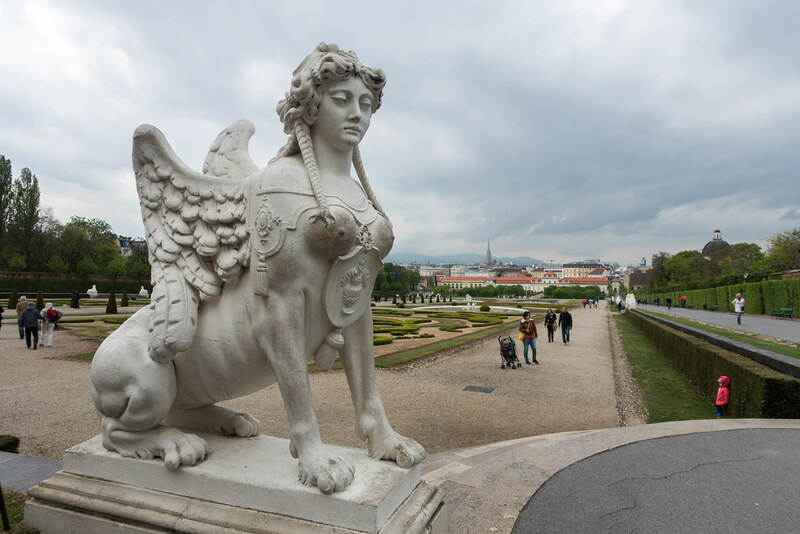 Austria’s capital city Vienna is synonymous with the finer things in life: arts, culture and decadence. 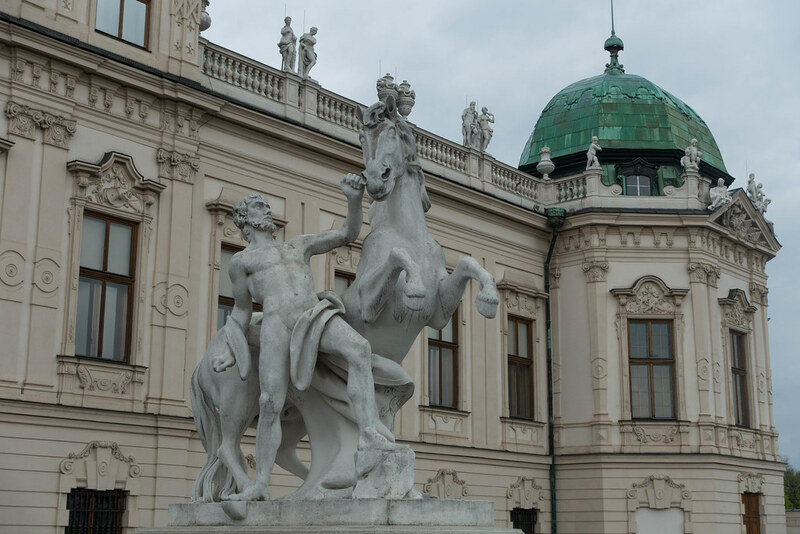 Between its grand imperial palaces, renowned classical music venues and opulent coffee houses, it delivers on these points in abundance. Beauty is everywhere. And yet, whichever elegant street you find yourself on, you’re never far away from a cheese-filled sausage or a breadcrumbed meat fillet bigger than your face. 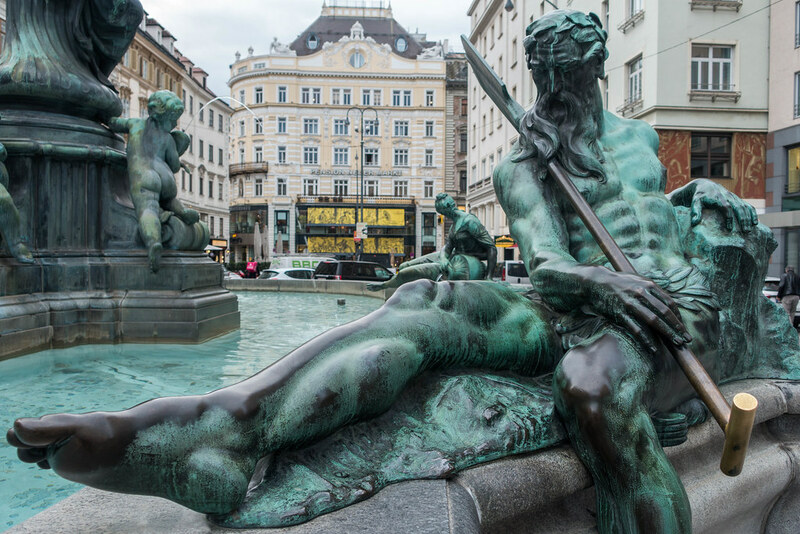 For me, Vienna began as a convenient stop-off on the way to the more appealing Budapest. 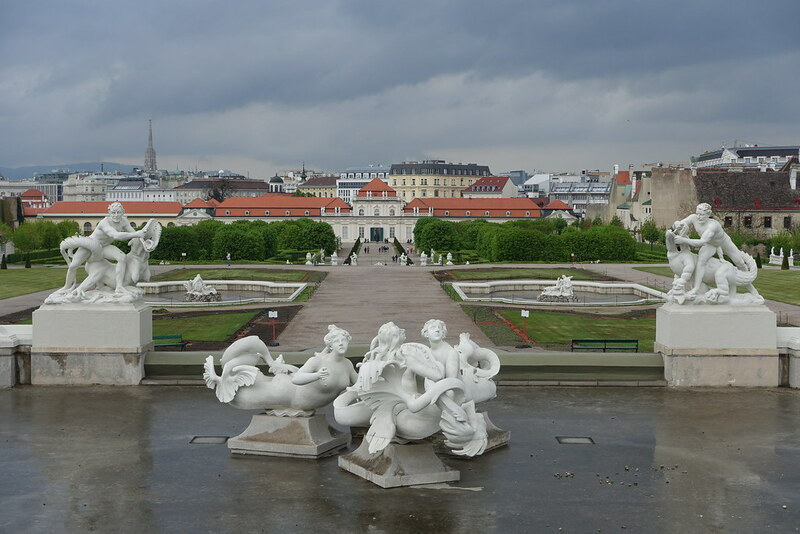 But after a mere two half-days in the city I was completely won over by its charms. 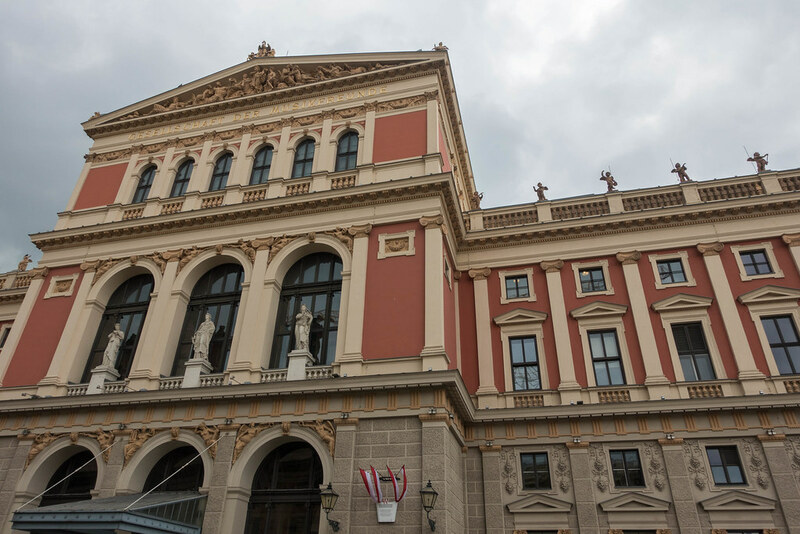 The next attraction on our list was the Musikverein concert hall, home of the Vienna Philharmonic Orchestra. We bought our tickets for the guided tour at 1pm (6.50 euro each) half an hour in advance, which was fortunate as it later sold out. 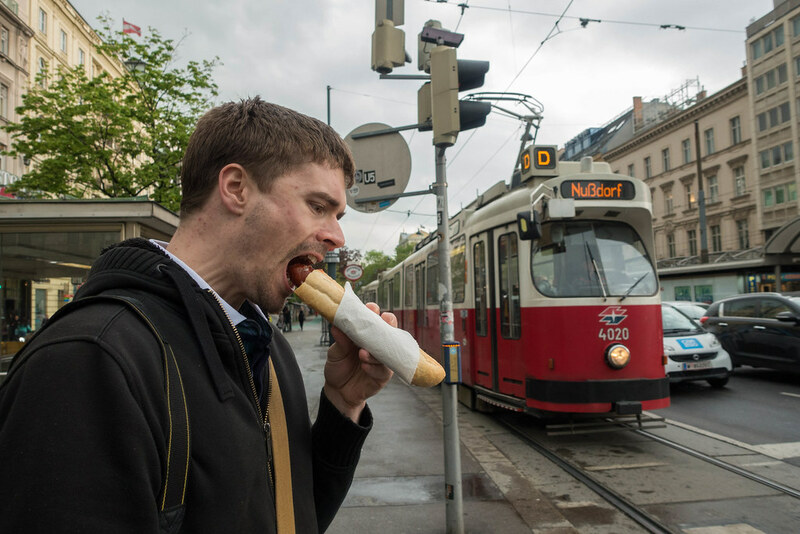 Before that we needed sustenance, and what better time to sample one of Austria’s favourite fast foods: a smoked sausage filled with cheese going by the name of Käsekrainer. 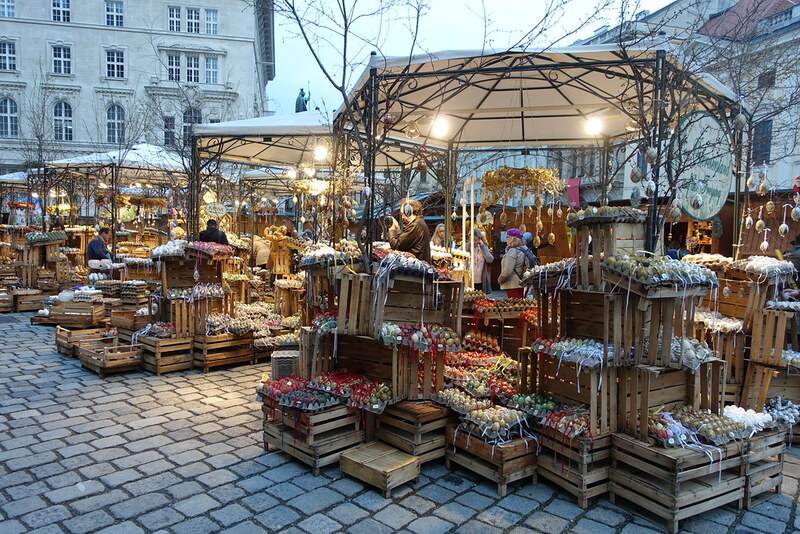 We found plenty of sausage vendors nearby, and minutes later we were greedily tucking into, and burning our mouths on, two giant cheese-stuffed sausages in baguettes. They tasted just as gloriously artery-narrowing as you would imagine! 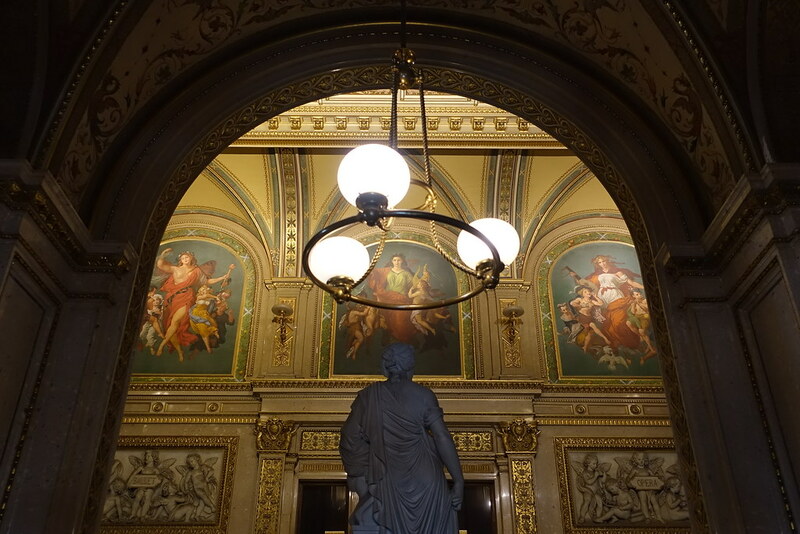 The guided tour of Musikverein was wonderful, except for the ban on taking photos. 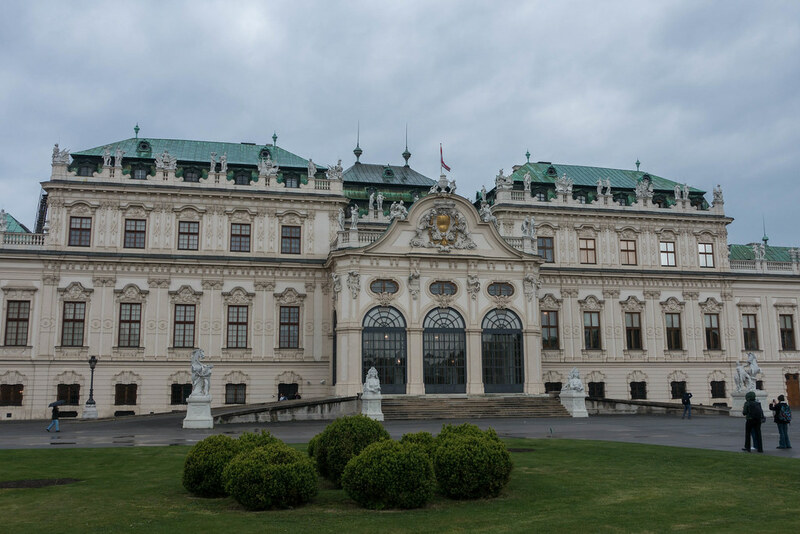 We were shown the two old halls, Goldener Saal (Golden Hall, where the famous New Year concert takes place) and Brahms Saal (named after the composer), as well as the newer Gläserne Saal (Glass Hall) which is used mostly for practice. 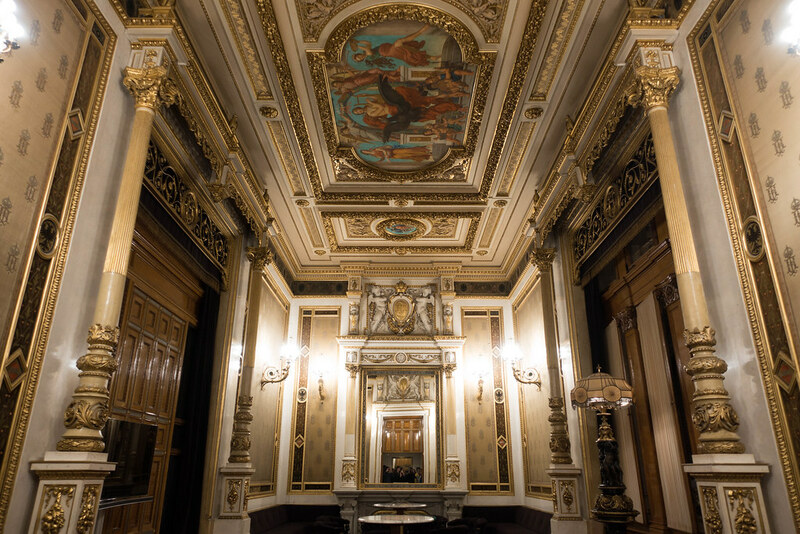 Photos of all the halls can be found on the official website. Of all the interesting things we learned about the building, the most interesting was the extortionate prices for the New Year’s Concert – which went well into the thousands! 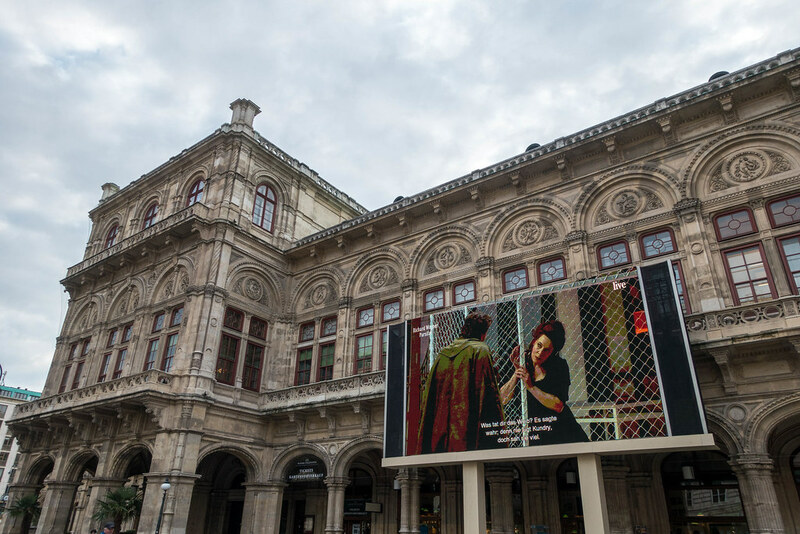 We managed to walk past the Vienna State Opera House, or Staatsoper, just as the giant TV screen outside was live-broadcasting the opera being performed inside. There are rows of concrete benches in front of this screen, allowing anyone to sit down and watch some world-class opera for free. 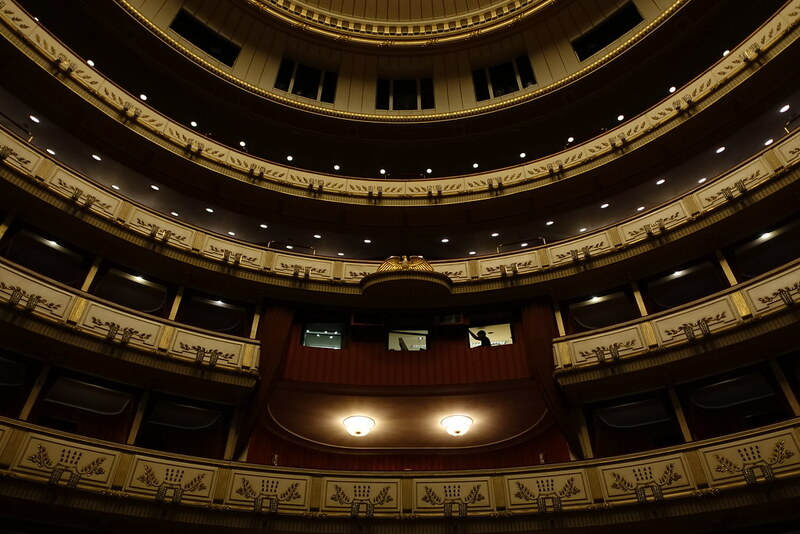 Opera’s not really our thing – and the subtitles were in German – so we hung around just long enough to get the gist of ‘Parsifal’ before continuing to wander. 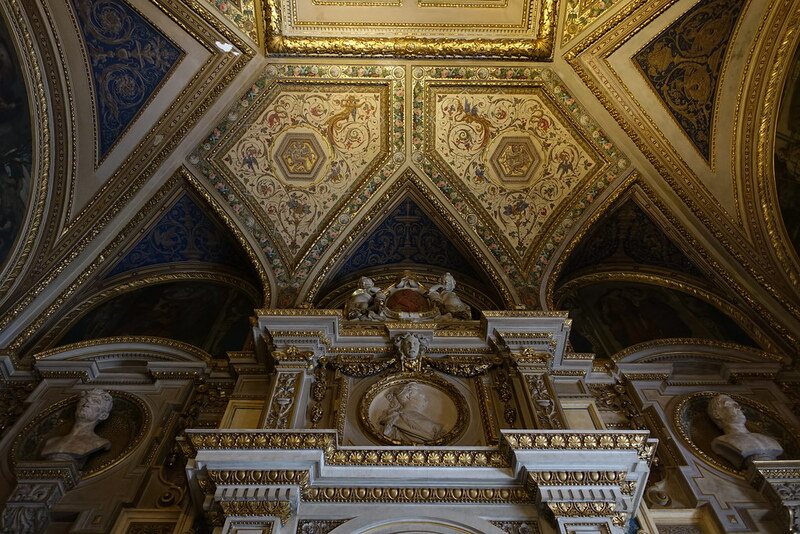 On our second day we returned to have a guided tour of the building (times vary, 7.50 euro each). 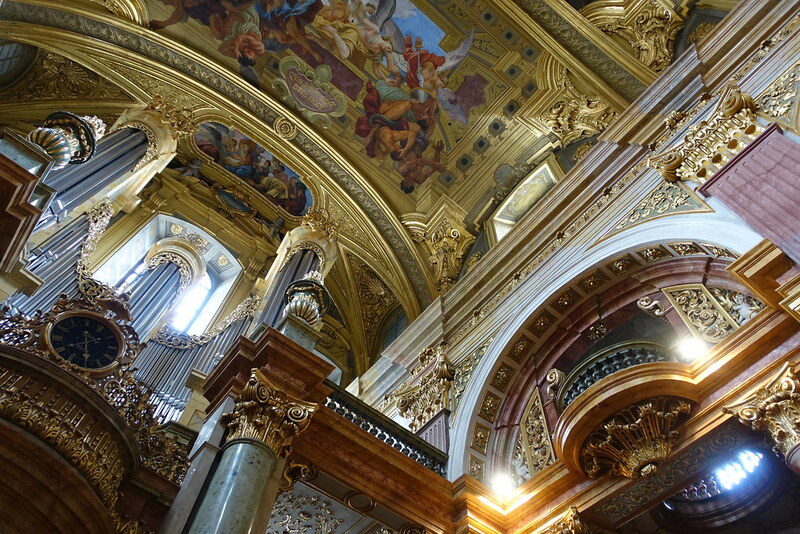 Unlike the tour of the Musikverein, this one permitted photography. 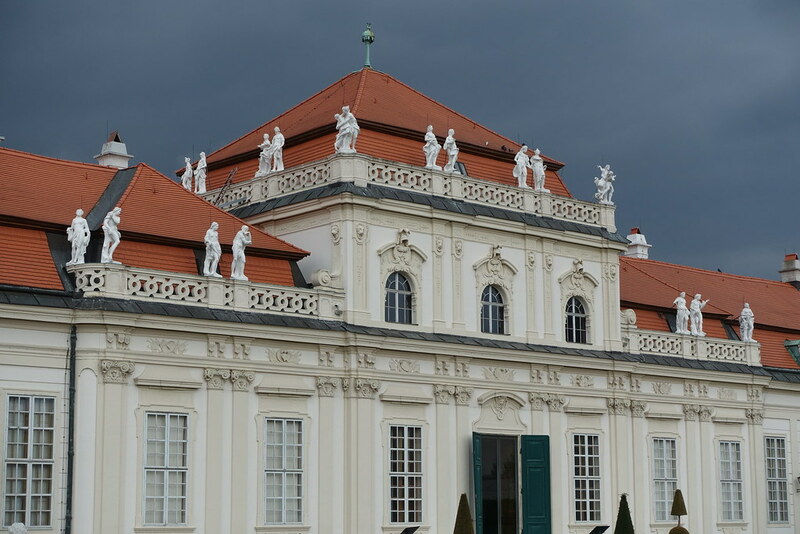 The tour was really interesting, our guide funny, and the building itself stunning. 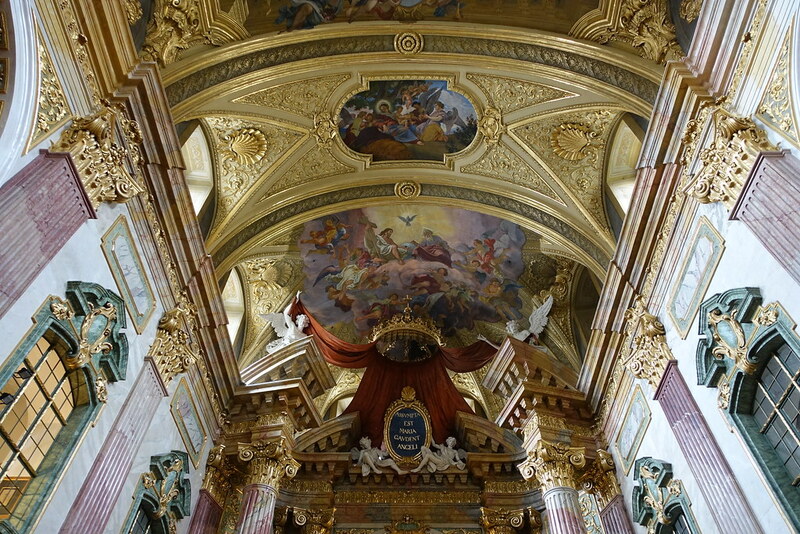 The only reason I ever step inside a church (besides weddings) is to admire the aesthetics, and in Vienna’s Church of the Jesuits (also called Universitatskirche) I was well rewarded. 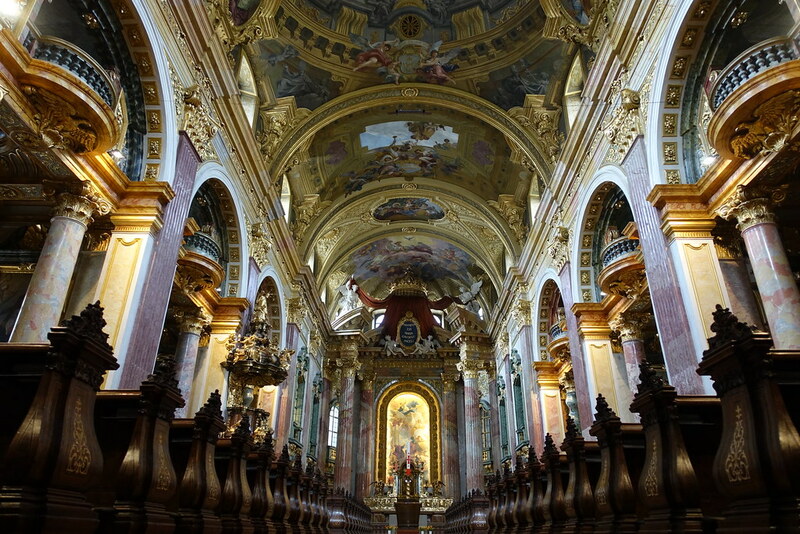 Located just a short walk from St Stephen’s Cathedral, this church’s unassuming exterior conceals a spectacular interior of painted ceilings, pink marble and gold in abundance. It’s free to wander round not only the grand main hall, but also the spooky crypt underneath. 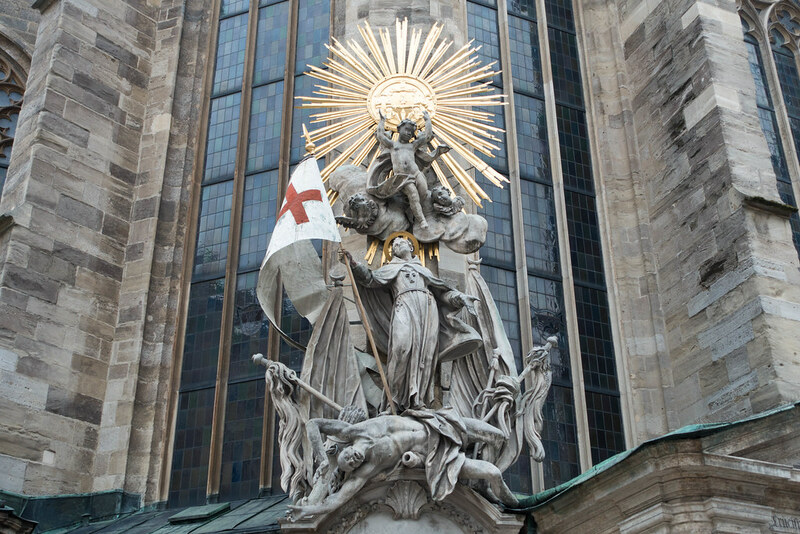 Something I really loved about Vienna was how much you can see just by walking around the city. We found some of the best sights quite by accident. 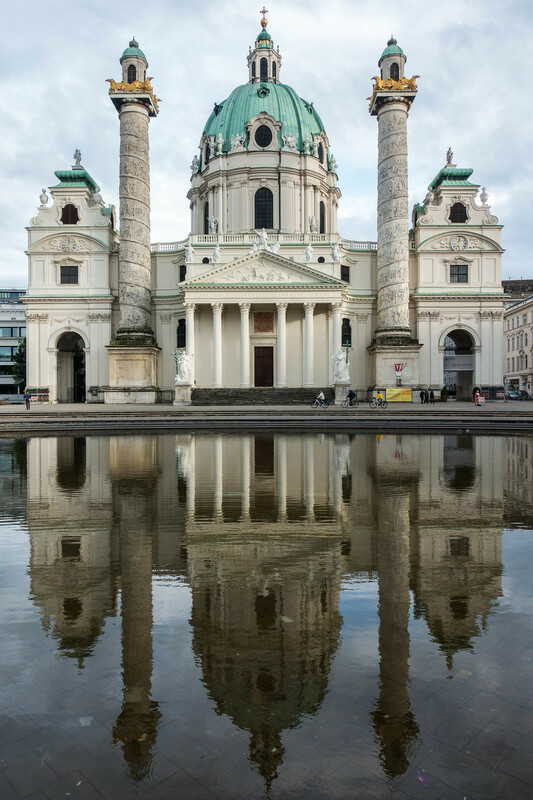 For example, we chanced upon the beautiful, turquoise-domed Karlskirche just as it began ringing its bells and as the brightening sky revealed a perfect reflection in the pool just in front of it. 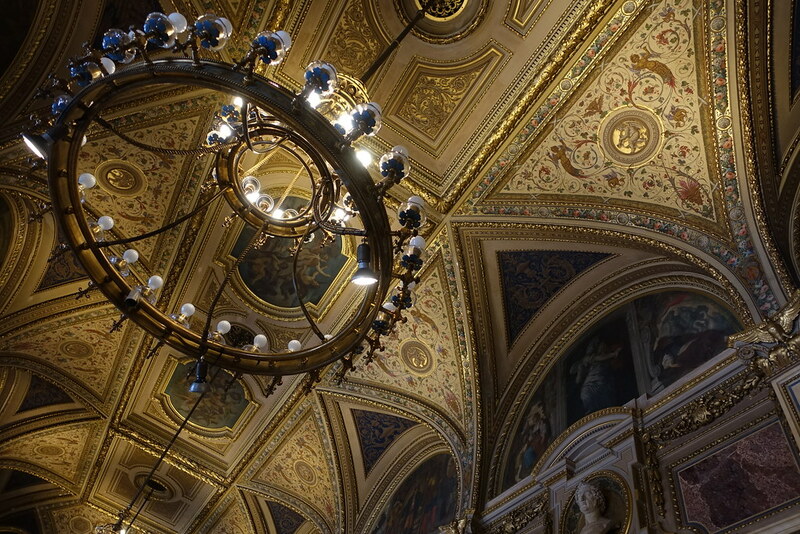 Hidden inside the Imperial Palace, otherwise known as Hofburg Palace, we found the incredible Austrian National Library which I describe in my blog post Vienna: inside the world’s most beautiful library. 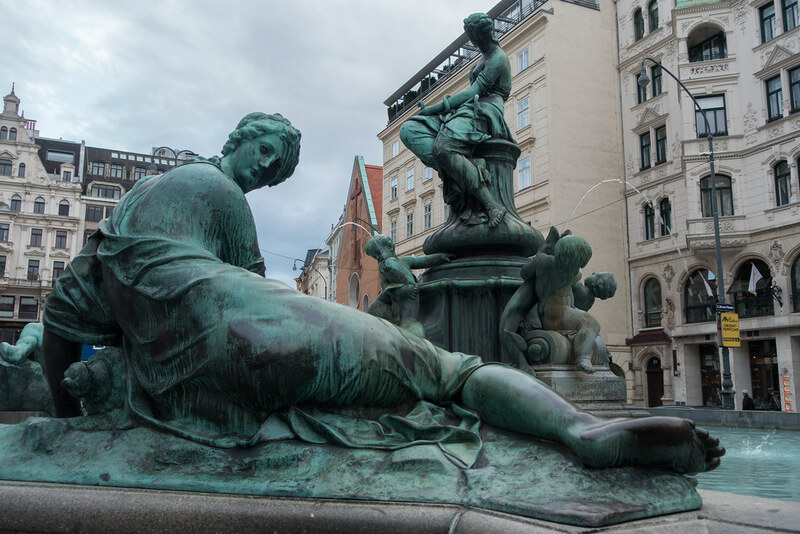 Between shopping streets we found a magnificent fountain surrounded by turquoise statues, as well as the Plague Column (Pestsaule): a tall pointed column formed of stacked organic shapes. 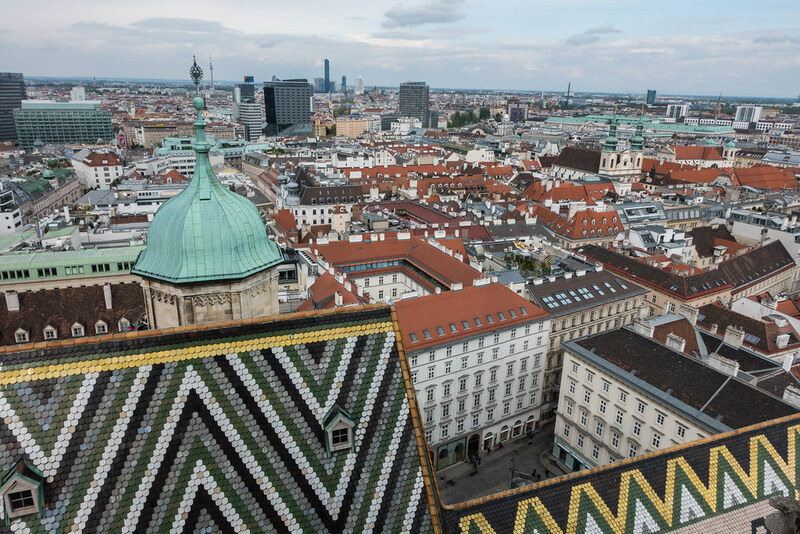 We climbed the south tower of St Stephen’s Cathedral but found it to be a massive anti-climax: its 343 steps lead to a very high-up gift shop. As you can see below, it’s just about possible to see the view from one of the small windows – but, on reflection, we should have just contented ourselves with the cathedral’s impressive exterior. 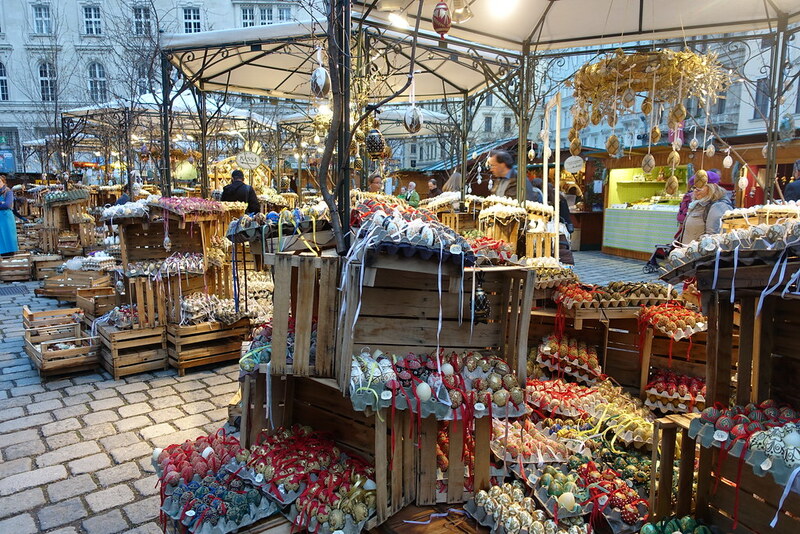 As dusk began to fall we chanced upon a few Easter-themed markets selling gifts, drinks and fresh food. In the middle stood stacks of wooden crates filled with hundreds of individually hand-painted eggs. 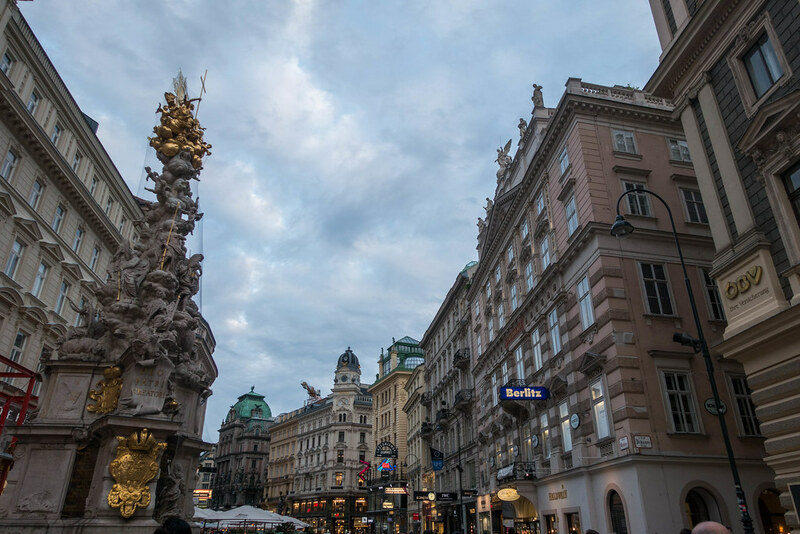 We returned on our second day in Vienna for a hot, fresh chimney cake covered in vanilla sugar and cinnamon. 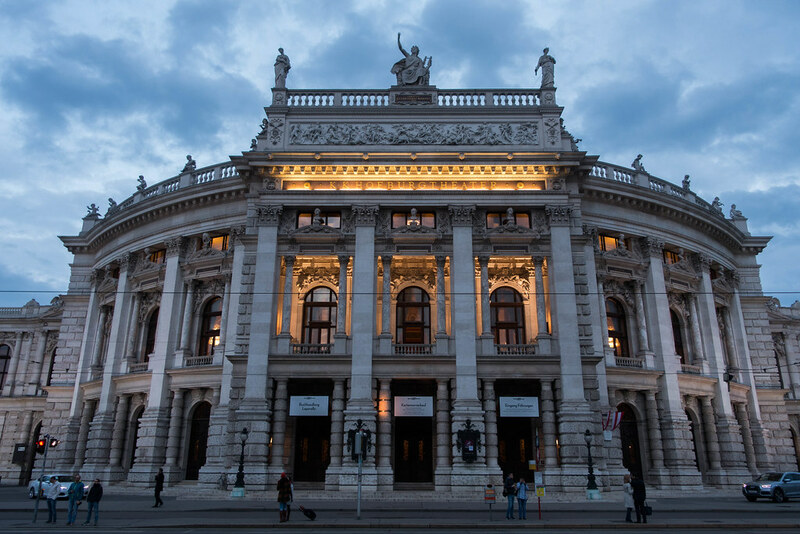 We reached the Burgtheater and Rathaus, which stand just across the road from each other, just in time to see the sky fade from blue to black. 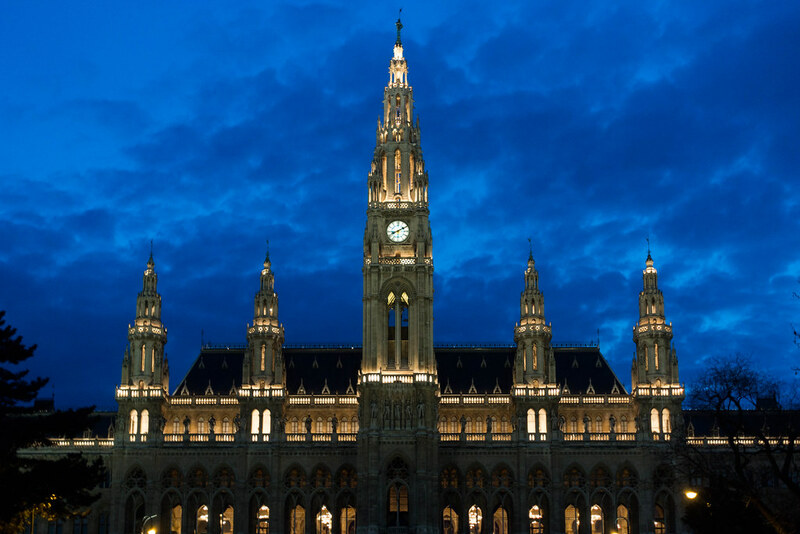 Both buildings look especially spectacular at night. 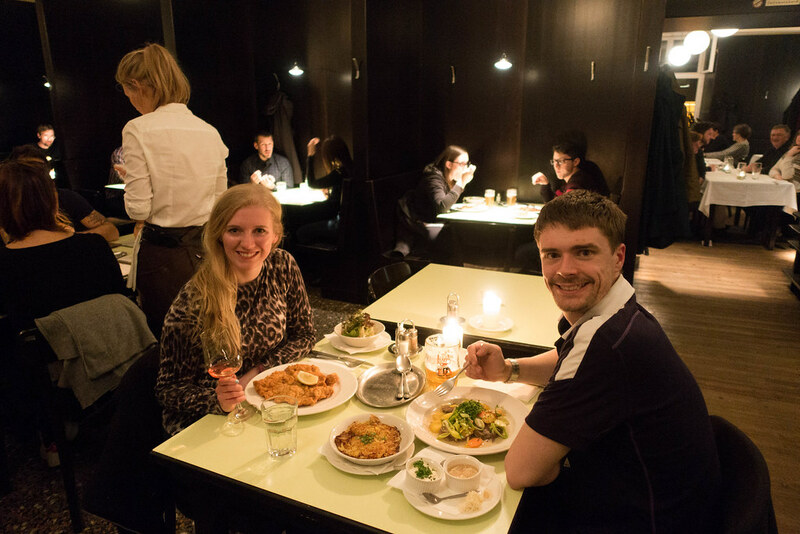 We didn’t know where to go for dinner on our first night – all I knew is that I wanted schnitzel! 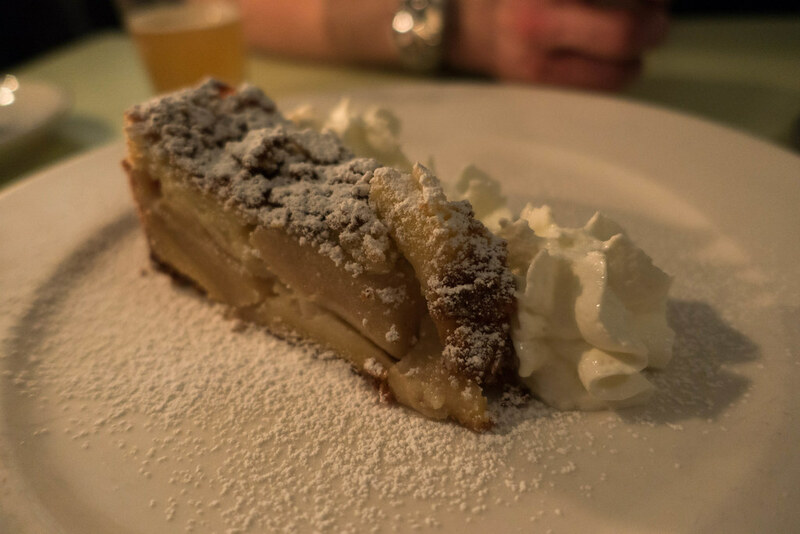 I satiated my craving at Glacis Beisl, a sleek, dark-walled and candlelit bar/restaurant with an under-street-level garden. 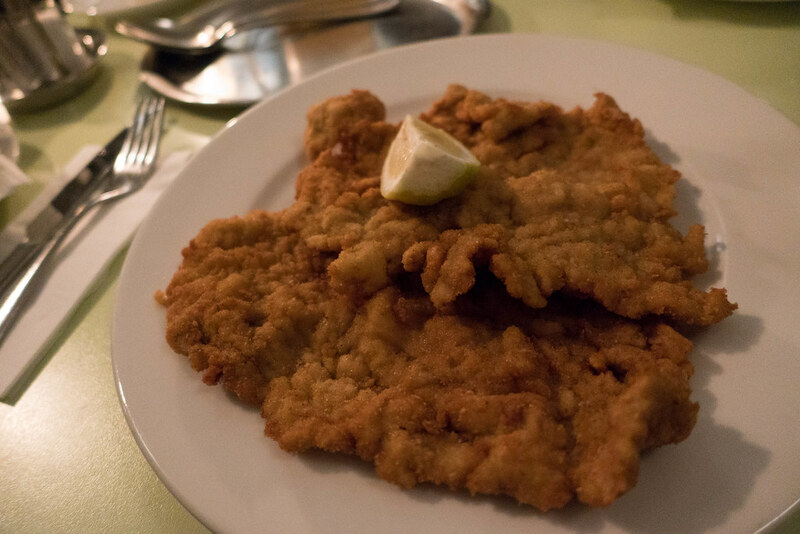 My schnitzel was huge and tender, accompanied by a bowl of deliciously dressed salad of creamy potato, sweet beetroot and varied leaves. 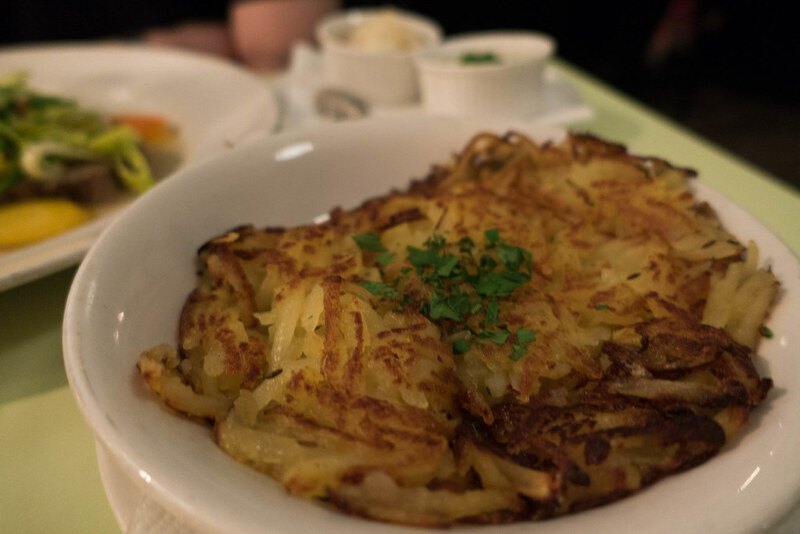 Steve had traditional Viennese boiled beef and potato rostis, followed by a sugar-dusted apple cake that we shared. Our second night was unfortunately an Easter Monday, which meant a lot of restaurants were shut. 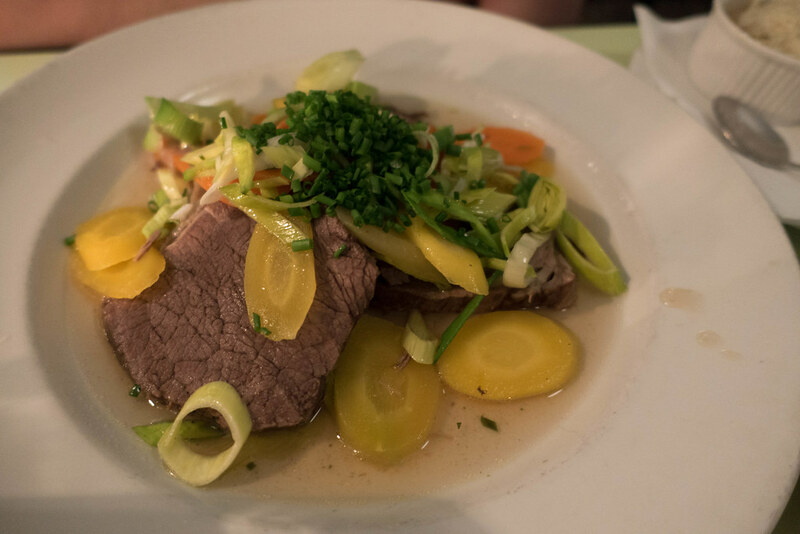 We were relieved to eventually find shelter from the rain at Restaurant Wiener Wirtschaft, which turned out to be a great choice. 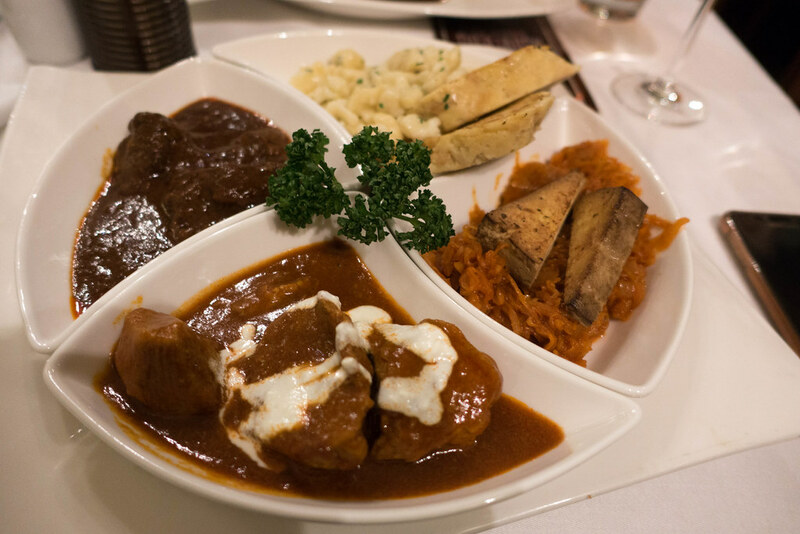 I had the ‘trio of goulash’ which was huge and came with my favourite side dish: lovely, buttery, squidgy Spätzle noodles! 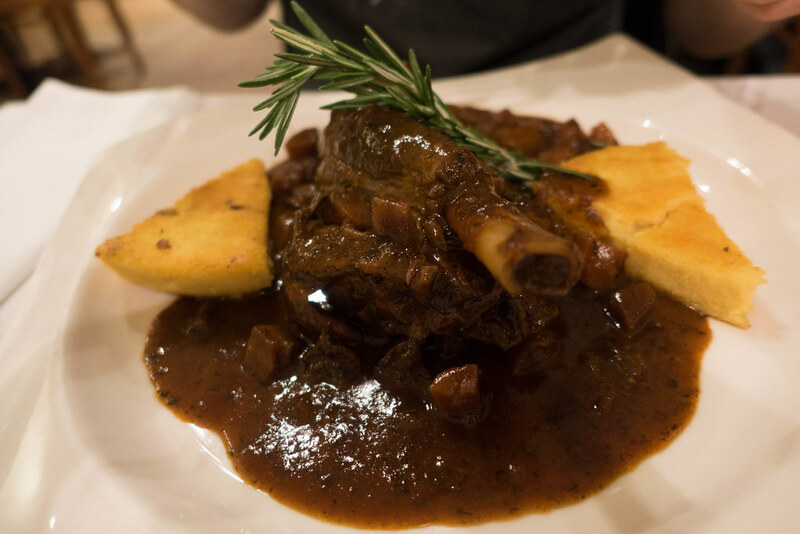 Steve had the lamb shank with polenta, an Easter special. 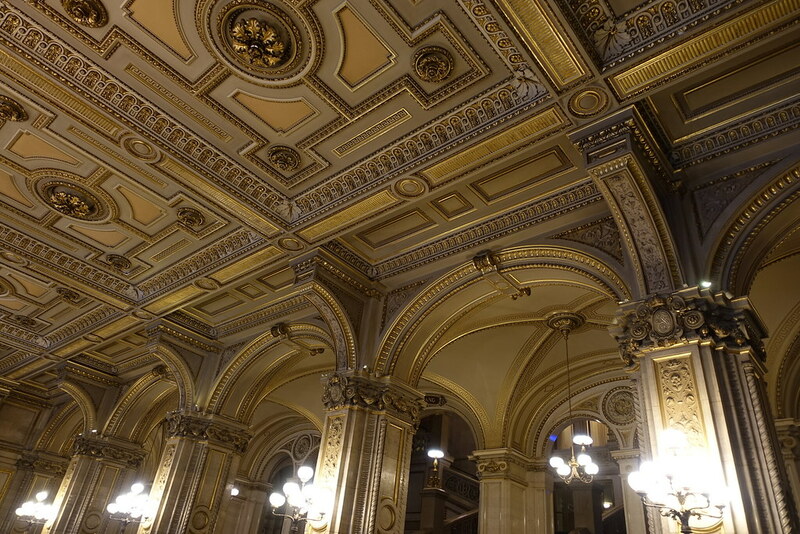 In my forthcoming, final post about Vienna I’ll detail the city’s grand cafes and coffee house culture – make sure you’re subscribed or following Roam with Juliet on Facebook to be alerted when it’s live. 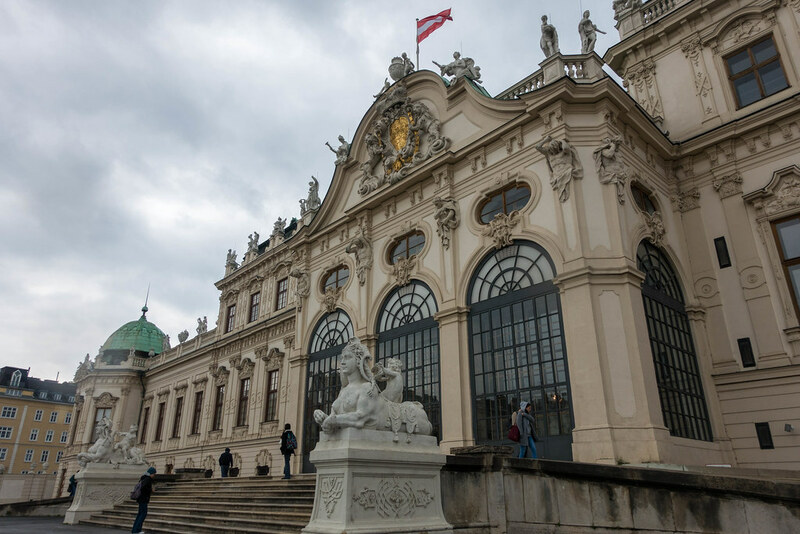 Posted in Central Europe, European cities, Photography, TravelTagged Austria, Belvedere Palace, Burgtheater, Glacis Beisl, Karlskirche, kasekrainer, Musikverein, Rathaus, Universitatskirche, ViennaBookmark the permalink.